Ahmed Shehzad wedding pics Top Pakistani opener batsman Ahmed Shehzad got married with Sana Murad..
Imran khan wedding shadi Reham pictures Imran khan chairman Pakistan Tehreek-i-Insaf and famous journalist Reham..
Umar Akmal wedding pics and images Umar Akmal famous Pakistani cricketer and younger brother of..
Veena Malik marriage pics Veena Malik a famous Pakistani actress and well-known model in modeling..
Wasim akram wife wedding pictures Wasim Akram a famous Pakistani left-arm fast bowler and renown..
Â Wedding pictures of Sara chaudhry Sara Chaudhry married Sami Khan, Sara is most popular model..
Amir khan boxer wedding pictures Pakistani origin boxer Amir Khan who is twenty six year..
Atif aslam wedding Atif Aslam the famous Pakistani singer married Sarah Bharwana in Lahore on.. Wedding pics of Vidya Balan Vidya Balan Bollywood actress married Siddharth Roy Kapur the UTV.. 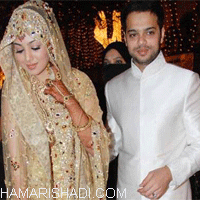 Wedding pics of Ayesha takiya Ayesha Takia married her boyfriend Farhan Azmi on 1st March.. 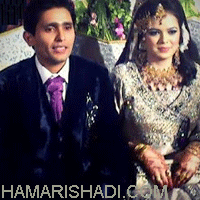 Wedding pics of Adnan Akmal Adnan Akmal is younger brother of two popular Pakistani cricketers.. Wedding pics of shehroz sabzwari Syra Yousuf and Shehroz Sabzwari married on 21st October, basically..